While John Dingell was the longest-serving congressman with a political career full of accomplishments, he was also a master on Twitter. 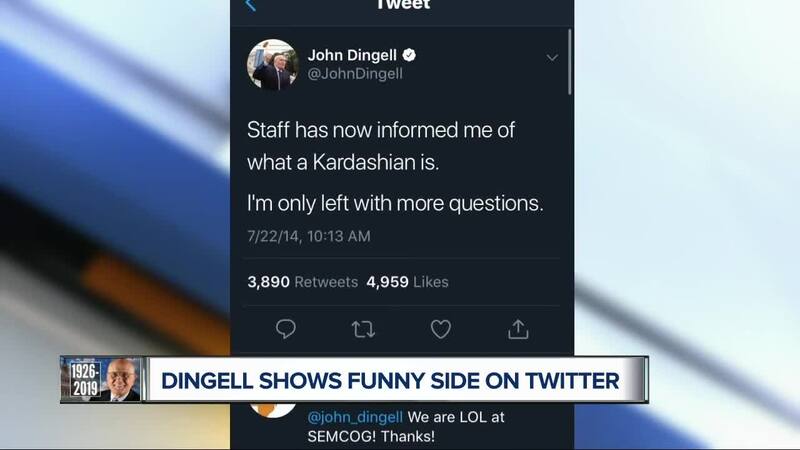 (WXYZ) — While John Dingell was the longest-serving congressman with a political career full of accomplishments, he was also a master on Twitter. Dingell, dubbed the "Dean of Twitter," gained a massive Twitter following for his sarcastic, funny tweets. Even when it was announced that he was in hospice care, he took to Twitter, despite his wife Debbie insisting not to, and tweeted, "You're not done with me just yet." It was his final tweet. 313 years ago today, Cadillac landed on the banks of the Detroit River. No, I wasn't there at the time.